Do we really need a “NEW YEAR” to start NEW HABITS? Lose that weight, Start exercising, Stop smoking Check… It can be daunting when your list of New Year’s Resolutions is as long as your holiday shopping list. In addition to the post-holiday slump, not being able to keep your resolutions for a month, or even a few weeks may increase your anxiety. When your holiday decorations are packed up and stored away, the frustration of an unused gym membership or other reminders of failed resolutions can make the later winter months feel hopeless. Why even make them because you always break them and your New Years resolutions become fastest way to break my New Years Resolutions. However, it is important to remember that the New Year isn’t meant to serve as a catalyst for sweeping habits It is a time for people to reflect on their past year’s behavior and promise to make positive lifestyle changes. 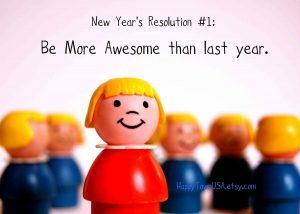 Setting small, attainable goals throughout the year, instead of a singular, overwhelming goal on January 1 can help you reach whatever it may be your striving for. Remember, it is not the extent of the change that matters, but rather the act of recognizing that lifestyle change is important and working toward it, one step at a time. By making your resolutions realistic, there is a greater chance that you will keep them throughout the year, incorporating healthy behavior into your everyday life. 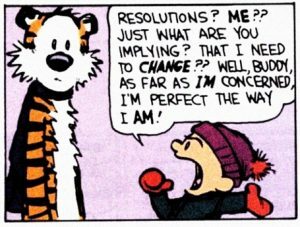 Some tips when thinking about a News Year’s resolution Start small Make resolutions that you think you can keep. If, for example, your aim is to exercise more frequently, schedule three or four days a week at the gym instead of seven. If you would like to eat healthier, try replacing dessert with something else you enjoy, like fruit or yogurt, instead of seeing your diet as a form of punishment. Change one behavior at a time Unhealthy behaviors develop over the course of time replacing unhealthy behaviors with healthy ones requires time. Don’t get overwhelmed and think that you have to reassess everything in your life. Instead, work toward changing one thing at a time. Talk about it and keep yourself accountable or even better have an accountability partner Share your experiences with family and friends. Consider joining a support group to reach your goals, such as a workout class at your gym or a group of coworkers quitting smoking. Having someone to share your struggles and successes with makes your journey to a healthier lifestyle that much easier and less intimidating. Don’t be hard on yourself up Perfection is unattainable. Remember that minor missteps when reaching your goals are completely normal and OK. Don’t give up completely because you ate a brownie and broke your diet, or skipped the gym for a week because you were busy. Everyone has ups and downs; resolve to recover from your mistakes and get back on track. Ask for support Accepting help from those who care about you and will listen strengthens your resilience and ability to manage stress caused by your resolution. If you feel overwhelmed or unable to meet your goals on your own, consider seeking professional help. Psychologists are uniquely trained to understand the connection between the mind and body. They can offer strategies as to how to adjust your goals so that they are attainable, as well as help you change unhealthy behaviors and address emotional issues. Generally it takes 30 days to form a habit. I have learned that starting your morning with daily affirmations and writing them out 30 times can help. Every day start your morning with a present tense such as I enjoy Weighing 110. If your mindset is constantly I want to lose 20 pounds or I want to lose 10 pounds and you will not reach your goal. I know I’m guilty of it but I would say I wish I could lose 10 pounds or if I could just only lose this last 5 pounds I would be happy. When you focus on making those changes they become a habit and part of your daily routine. If you’re constantly saying I don’t want to gain weight I don’t want to gain weight eventually you’re going to gain weight. Refrain yourself from focusing on the negative outcome and pride yourself in the positive outcome. I would suggest restructuring your mindset to not see the negative as much but to fill those voids with positivity. Try finding the positive out of every situation there is always good no matter what and any challenge good or bad. It’s a matter of changing your perspective towards the outcome of any situation. I am a firm believer in things happen for reason. I recently lost my wallet in a parking lot on a weekend night. The next day I was headed out of state and I realized I was without my wallet. I backtrack my steps and realized that the store I was that last was closed on today. My first initial response was how can I lose my wallet what was I thinking. But I stood back and was like maybe I lost my wallet for reason maybe I wasn’t supposed to go out of state I need to be more accountable for my personal belongings. So many things were going through my mind at that moment but when I did backtrack my steps I actually felt calm and at ease knowing that it actually might be in the store and it would be safe. I look to find another learning experience out of it. The next day I called the store and they had found it and put it in there safe. Who knows if I wasn’t supposed to go out of state who knows what the defining lesson I was supposed to learn but I know now to second check myself when leaving a store and make king sure I do have my wallet with me. Those little things come to you as are you a victim or are you a player. I could’ve easily said how could this happen to me why does these things always happen to me life is so unfair. It seems when you focus on that negativity brings on more things that aren’t as happy. You want to be a player in life and take on every challenge and say bring it on. Being a player doesn’t necessarily say you’re not allowed feel emotion. What it means is being a player is go into every challenge you have finding the good out of it. What it means is being a player is go into every challenge you have finding a good out of it.Don’t go in to the situation as a victim and feel like the nature has it out for you. Example for any sports fans out there if you’re to hit a golf ball. Say you had to hit a golf ball over a Sandtrap now if you’re thinking in your mind don’t hit the Sandtrap don’t get the Sandtrap guess what you’re going to hit the Sand trap What you focus on expands so focus on hitting the ball in the hole. Focus on enjoying weighing 110. Your mindset has a lot to do with accomplishing your goals.